A5 Greeting Card, A6 postcard, mini ,midi, and large print mounted with cream board. Prices on order form. 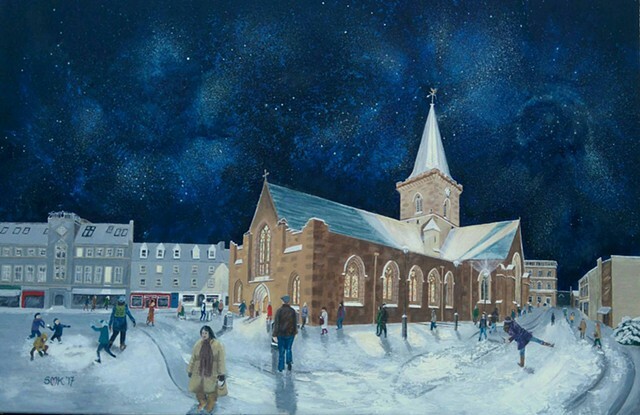 Here is St John's Kirk in the heart of Perth, Scotland. Although I love using the poetry of my hymn book, this title came from the poet Helen Dunmore and gave me a secular 'hook' onto which I could hang my image. I think it suggests the infinity and eternity of the universe at the same time as the finite nature of our lives. I hope the Church will remain standing for many centuries to come. All the stars should be present and correct. I'm not sure I have the scale of these quite right but I have done my best interpretation of the sky at the Mid-Winter Solstice facing North East.